Showtime is 7:30 pm. $37-$47 per person. Beginning on March 7th St. Joseph’s Society will offer Lenten Fish Fry every Friday evening throughout Lent as an opportunity for the entire community of Fredericksburg to join in a constructive community outreach. The event is not viewed as a fundraiser but as an effort to bring together those of ALL faiths to meet for dialogue, discussion, and dining during the Lenten Season. For those who wish to attend, Stations of the Cross Devotion will occur on Fridays at 6pm in the Marien Kirche with plenty of opportunity to attend the meal following the devotion. This is the 5th year for this event and the support and attendance has been outstanding from the community over the past 4 years. Meals to go will be available, but there is no drive thru as we are hoping that people will wish to stay, meet new people, visit with old friends, and socialize during the event. For more information please contact Darin Holmes at 456.1999 or Carlos Juenke at 456.9645. The B-17, B-24 and P-51 are on the 25th season of the Tour. Tour through the authentically restored aircraft or take a flight aboard for the ultimate immersion in history! Call (978) 562-9182 for flight reservations. At the Gillespie County Airport. Participating wineries have taken advantage of their close proximity along Highway 290 to create the Wine Road 290 Trail. Is there a better pairing in the world than wine and pasta? Nine local wineries partner with the finest restaurants in the area during normal winery hours on Saturday. Tasting fees may apply. The Indian Artifact and Collectible Show showcases Native American items such as artifacts, collectibles, books, jewelry, fossils, pottery and more, and takes place at Lady Bird Johnson Park’s Pioneer Pavilion, 432 Lady Bird Drive. For more info, please call (830) 626-5561. This three-day event is co-produced by the Friends of Fort Martin Scott and the Former Texas Rangers as a Spring Break experience for children, utilizing continuous programs which are rooted in Texas history and character education. Activities include living history re-enactors, pioneer crafts, demonstrations and games, live music, storytelling, Native Americans, shootouts and chuck wagons. Thursday 1 to 4 pm; Friday 10 am to 3 pm; Saturday 10 am to 3 pm (chuck wagon meal 11 am to 1 pm); Sunday 8 am cowboy breakfast; 10:30 am to noon cowboy church. Admission is $5 per car load. Saturday chuck wagon cooking is $5; Sunday cowboy breakfast is $3. 1606 E. Main. Adam Trent is taking the world by storm. He blends dancing and singing to his own original pop music with innovative stage illusions and charming wit and emotion to create an experience that is part magic show, part concert and part stand up comedy. Don’t miss this show! Tickets available by phone or online. Two performances only! Join us for a discussion on rationing during WWII and the importance of growing one’s own food. We will start individual Victory Gardens and make “synthetic rubber” silly putty. To be held in the Nimitz Ballroom and the Memorial Courtyard at 340 E. Main St. Children must be accompanied by an adult. Space is limited – please call or RSVP to vinyard@nimitzfoundation.org Cash or check only please. 10:30 to 11:30 am. $5 fee per child age 6 to 13. Call (830) 997-8600 ext. 205 for more information. Historic crafts, activities and demonstrations including quilting and stoking the forge at the blacksmith shop. Try your hand at making rope or biting into a biscuit cooked in a Dutch oven over an open campfire. Stroll through all of our historic buildings. Daily 10 am to 5 pm except closed on Sunday. $5 adults; students 6 – 17 $3; children 5 and under are free. 325 W. Main. Call 830-990-8441 for details. Members of the Fredericksburg Art Guild, 308 E. Austin, reflect on their pride in our State. Opening reception from 4 to 8 pm during First Friday Art Walk Fredericksburg. Call 830-997-4949 for details. InSight Gallery, 214 W. Main, is proud to host our sixth annual Texas Masters show featuring new works by the finest Texas artists living and working today, each with their own unique voice but collectively as diverse as the State of Texas. This year we will have a Texas-sozed celebration with Garrison Brothers Bourbon on site to share their latest Texas whiskeys. Wild game, margaritas and heavy hors d’oeuvres will round out the Hill Country fare. Opening reception from 6 to8 pm during First Friday Art Walk Fredericksburg on March 7. Call 830-997-9920. During Spring Break, experience the sights, sounds and taste of the front lines with this fully functioning WWII Field Kitchen at the National Museum of the Pacific War’s Pacific Combat Zone, 500 E. Austin Street. Byron “Cooky” Vinyard from the Tri-State Living History Association has spent the last 10 years putting this kitchen together. He has traveled all over the country providing meals for veterans on special days and educating the public on the history of World War II. Call (830) 997-8600 ext. 205 for details. 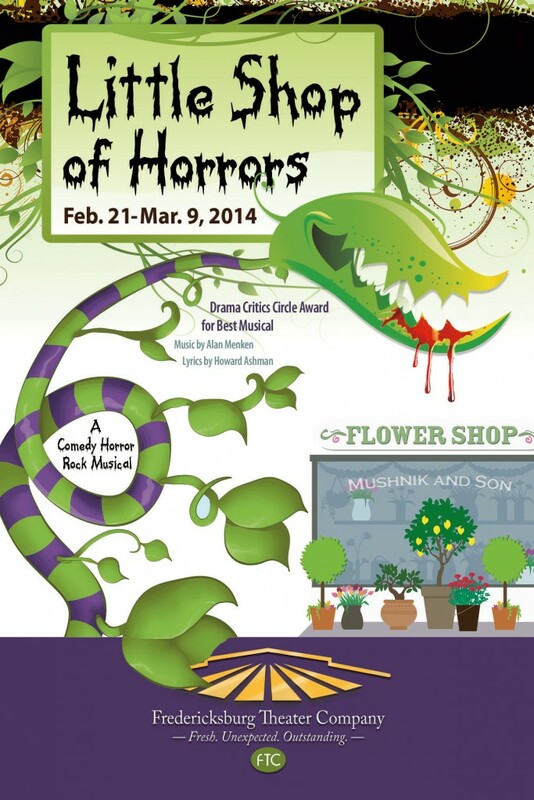 A hapless florist, a blood-thirsty plant, a Greek chorus of doo-wop singers and the search for fame, fortune and love create an innocent-looking “Little Shop of Horrors” – and a riotously funny musical by Alan Menken and Howard Ashman that will make you scream . . . with laughter. At the Steve W. Shepherd Theater, 1668 S. US Hwy 87. Tickets available online or at 830-997-3588. Fridays and Saturdays at 7:30 pm and Sundays at 2 pm.